Here in London, we apply modern technology to hand laser the border onto the weave. 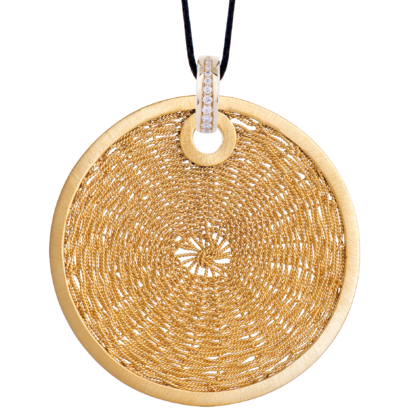 An exquisite pendant & a gorgeous addition to any wardrobe. Combining beauty with exceptional versatility, the diamond huggy (clasp) can be detached from the pendant & worn alone on the cord for a more discreet look, as well as accessorized with a different pendant, or clasped to another huggy.